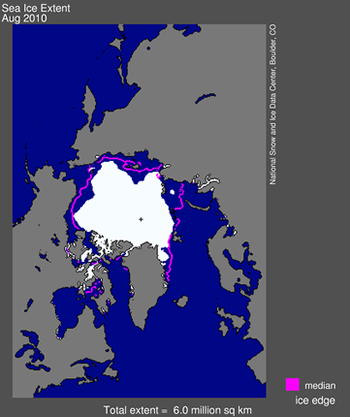 The National Ice & Snow Data Center indicates on September 7, 2010: « …Arctic sea ice generally reaches its annual minimum extent in mid-September. This August, ice extent was the second lowest in the satellite record, after 2007. On September 3, ice extent dropped below the seasonal minimum for 2009 to become the third lowest in the satellite record.